For the most part, many outdoor swings built these days come with weather resistance features. This could be in the form of PVC coated cushion covers, corrosion-resistant metal frames or even water-proof frame weaving. However, investing in a hanging chair protector is still something worth considering. This is especially the case if your swing set doesn’t have any of these protection features. Below is a comparative review of 3 popular models on the market and what each has to offer. 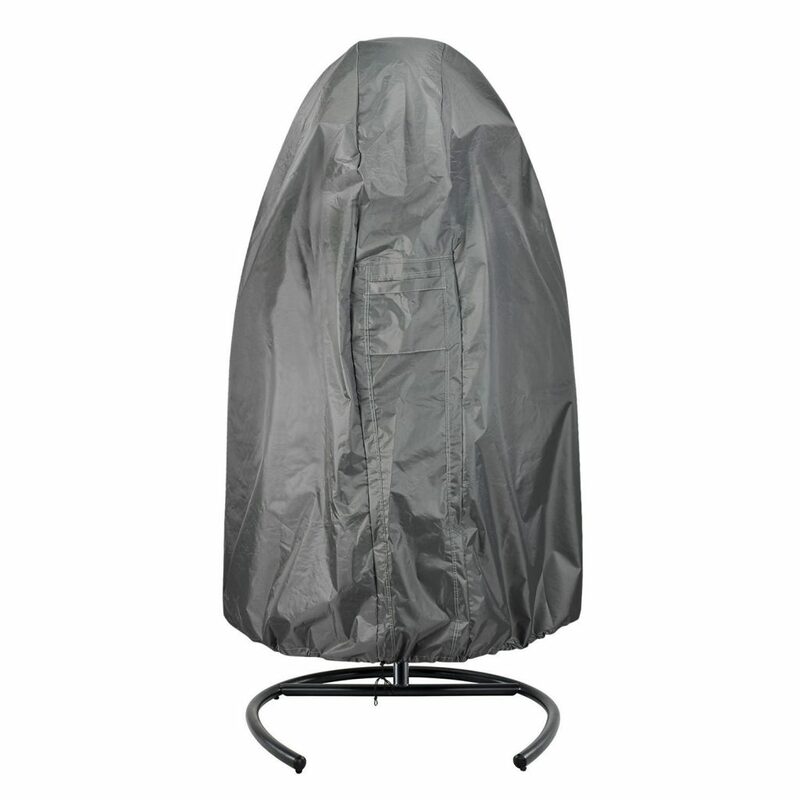 This swing chair cover is made from 420D Oxford fabric that is coated with a layer of PVC. This design makes it UV resistant which protects the seat from effects of harsh sunlight including fading metal frames and paint chipping. 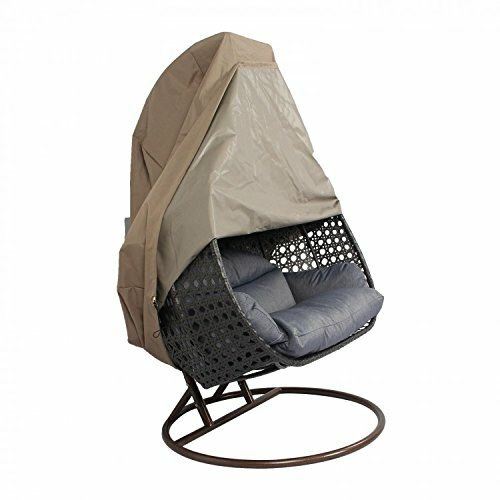 The material is also 100% waterproof which protects the swing chair from precipitation including rain, snow and high humidity in general. This comes in particularly handy if your swing contains rust-prone parts. The cover features covered side vents that allow proper air circulation even when the seat is covered. That way, you don’t have to worry about any damp odors or heat waves hitting you when you uncover your swing to use it. Finally, it comes with click-close straps. These are meant to allow you to easily fasten the cover around the swing. It also keeps it stable in windy conditions so you don’t have to chase a flying tarp up and down your backyard. a mere 8.8 ounces which also contributes to this ease. The vents ensure that even as water, UV and other pollutants are kept out, fresh air is allowed in. This is especially important if you have absorbent cushions or wooden parts that are affected by high humidity and heat. With all its features taken into account, this cover is best suited for average-sized 1 person egg swings with absorbent cushions. The ease of application is also a bonus if you do not want to have to struggle with a heavy cover every time you want to access your swing. Finally, it is also the cheapest of the three swing chairs and therefore a great option if you are working with a tight budget. This cover, on the other hand, is made from 600D Oxford fabric. This is significantly stronger than the 420D used on the CKClub cover. The additional strength makes it significantly more durable. The cover is also covered with PVC coating. This makes it UV resistant and waterproof. It can, therefore, protect your swing from all forms of harsh weather. The swing cover has an elastic hem cord. This allows you to fasten it at the base. The design comes in particularly handy if you are trying to keep pets and other small animals from crawling under the tarp and onto your seats. It is also important when it comes to keeping the swing chair protector stable and intact during windy weather. used to cover much smaller seats making it very versatile. handle the large cover when putting it on and taking it off. 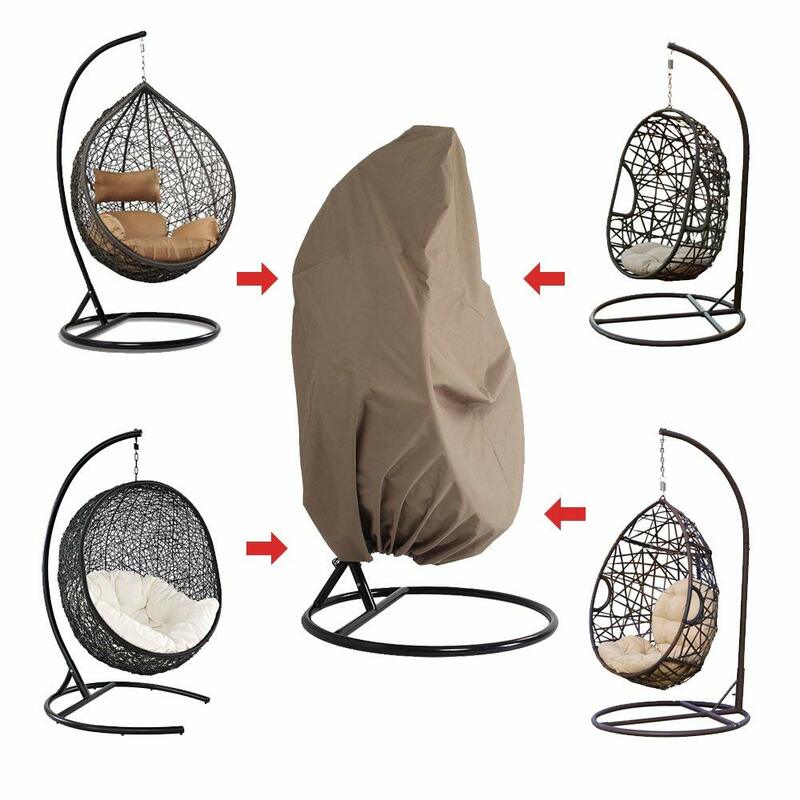 This is the ideal cover for almost all outdoor hanging chairs – most 2 person porch swings and all one seat swings. The versatility also means that you can use it on different swings in your compound despite size differences. It is also a great option to consider if you want full value for your money in terms of durability. 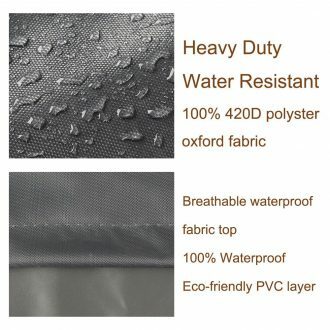 However, the lack of ventilation mesh means it might not be a good option for seats with absorbent cushions or other material that could be damaged by the dampness. For the most part, this Island Gale patio cover is similar to the other one already reviewed. 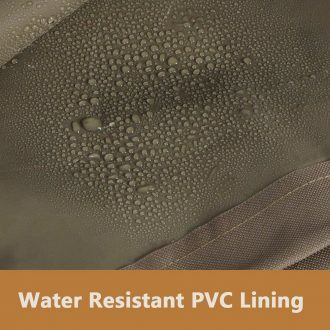 It is made from the same PVC coated 600D Oxford fabric for maximum protection, strength and durability. It also has the same buckles and adjustable hem for additional protection. The key difference between the two is in the dimensions. This particular option is designed for small one person swings much like the CKClub cover. It has dimensions of 78.74 in height by 68.9 inches in diameter. The diameter is wider than CKClub’s which makes it easier to apply to a wider variety of single swing chairs. This is as a result of the material used. You can therefore rest assured that both the swing and the cover will be safe for a long time. It might not be as light as the CKClub but it is significantly lighter than the other Island Gale model. This makes it easier to set up. Despite all these amazing features, it can still only be used on single-seat swings. The size limitations and the lack of proper ventilation put it at a disadvantage compared to the other 2 covers. However, if your key priority is durable protection for medium-sized swing chairs then it is definitely worth considering.